The Lovable Lavender edition of the famous Ms. D-Cell Robot. 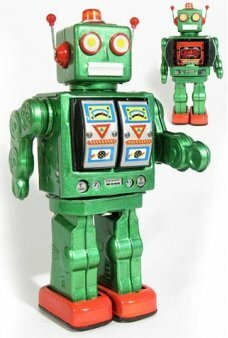 Wearing black rolling robot shoes, she walks forward, rotat.. 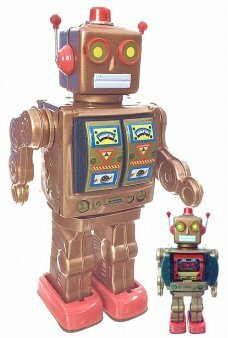 This Mr D Cell Bronze robot is a special version of our famous large robot with a handsome shiny bronze body and a golde.. 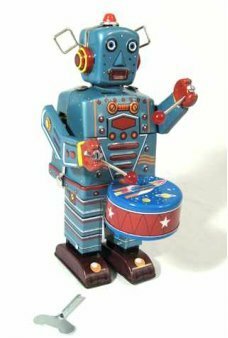 The Drummer Robot walks forward while he bangs on his space drum. 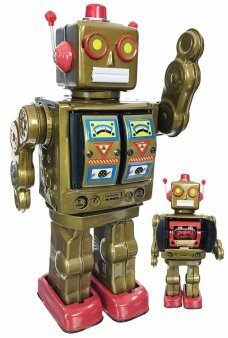 Just wind up our drummer and he walks while beating o..
Our Biggest Golden Robot! He walks forward looking for a target. Suddenly, his upper body fully rotates three times and .. 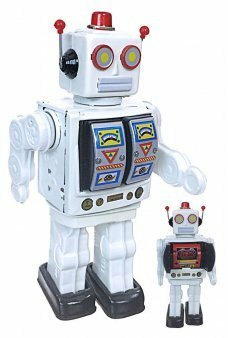 The Electric Snowman Robot edition of the famous Mr. D-Cell Robot wears all white to hide in the snow! With h..
Beautiful maroon red special edition of the famous Mr D Cell Robot! With his large black boots he walks forwa.. The Talented Tangerine edition of the famous Ms. D-Cell Robot. Wearing red rolling robot shoes, she walks forward, rotat.. 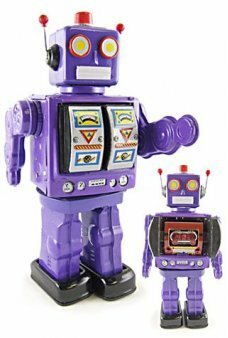 The Purple Edition of the famous Mr. D-Cell Robot. He walks forward, rotates his upper body three times and opens her ch.. 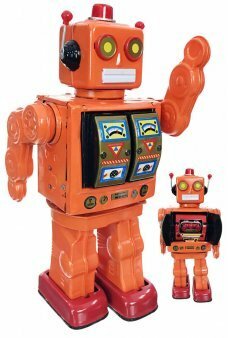 The original Mr. D-Cell robot in Orange! Wearing red rolling robot shoes. He walks forward, rotates his bright ora.. The most masterful robot creation! 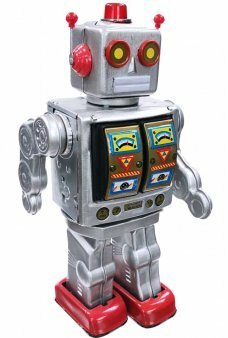 Our large, silver Smoking Robot is an exacting replica of the Japanese original by Yo.. The most masterful robot creation! 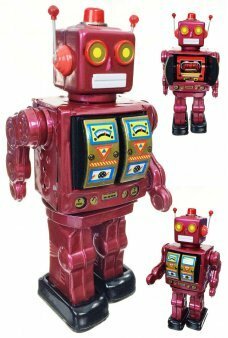 Our large, dark grey Smoking Robot is an exacting replica of the Japanese original by..